Over the course of a year, Jesse Cesaria probably called Mike Theophil close to a hundred times. And each time, Theophil would look at the name that popped up on the caller ID, see that it was Cesaria and would promptly put the phone back down, ignoring it. They were friends. In fact, they were good friends, going all the way back to middle school, but in 2010, Theophil's junior year at Ludlowe High School, Cesaria moved to Florida. And because of that, Theophil lost a drug buddy. Together, they had smoked pot. They had popped pills. They didn't care about school. Or sports. They had taken a wrong turn down a wrong path and neither one really cared that they had. Until one day, when Cesaria called. "Hey," he said to Theophil. "I've accepted Christ into my life and I think you should too." That was the last time Theophil would speak to Caseria for almost a year. Until one day, when Theophil called Caseria and said. "Dude, I need to change my life. I'm going to try out your God." Sitting on a coach in the cramped office of University of Bridgeport basketball coach Mike Ruane not too long ago, Theophil is telling his story. Everything. The good and the bad. And there was a lot of bad. There were drugs. There were bad decisions. There were missed opportunities. But that was then. This is now. Today, Mike Theophil is living life anew. 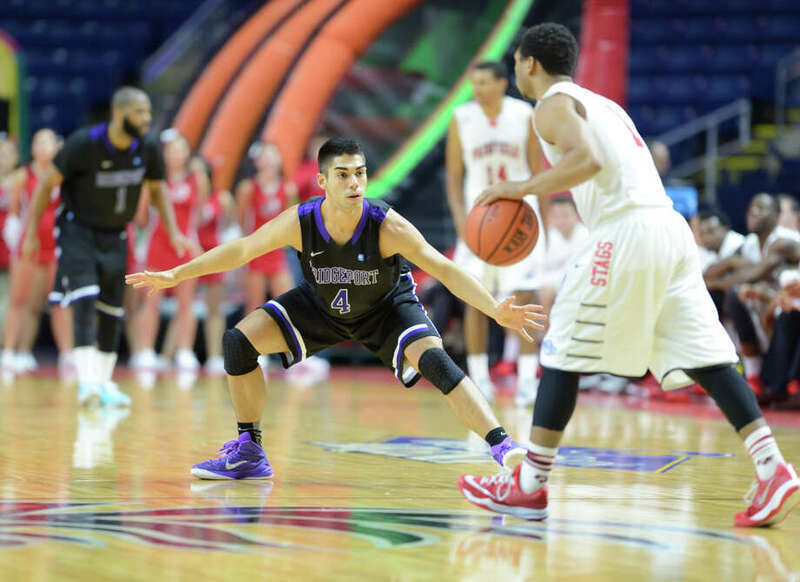 He is a guard on the University of Bridgeport basketball team under head coach Mike Ruane. He's on scholarship and on the Honor Roll and Dean's List. He's majoring in psychology and looking to go into the university's teaching program. And on December 28, it will mark the third year of sobriety for Theophil, a status he worked incredibly hard to achieve and is working incredibly hard every day to maintain. "I feel great. It something that I can only explain as a supernatural thing," Theophil said. "There's a higher power that's keeping me where I am. All these new people that are in my life, like coach Ruane, he's a guy that believes in second chances and he's given me the opportunity to be here. He believes in me." Ruane is a believer in second chances because, growing up near Reading, Pa., he also got a second chance from a coach, a gesture he's never forgotten. "Honestly, I see a lot of myself in (Mike) because I went down that same path," Ruane said. "I had a father who was an alcoholic, I partied and did a lot of the same things Mike did ... didn't study, but I had coach who gave me a chance. So we try to do that here to kids all the time, give them a second chance." Out of 135 kids at Holy Name High School, Ruane was 118th. Still, Alvernia College head basketball coach Rod Hand gave him a scholarship. Ruane never finished his freshmen season. He flunked out. He transferred to another school and flunked out of that one as well before going back to Alvernia and sitting out a season to get his grades up. Ruane eventually received another scholarship, starred at Alvernia under Rick Binder and went into coaching. He's now in his 15th season at UB. "This is why I love guys like Mike," Ruane said. "He appreciates the opportunity and he comes here and works so hard every day. That's what you want these kids do to, appreciate the opportunity." Early on, however, Theophil appreciated nothing. His father left when Mike was little and admittedly, he put his mother Teodora through "a tough time." "I rarely spoke to her," Theophil said of his mom. "I'd be out of the house all the time." He played basketball, but never put the effort into it that he should have because he "didn't like" his coach at Ludlowe, Brian Silvestro. "He played for me. I was his JV coach and the assistant coach at Ludlowe," Silvestro said. "I always thought that maybe because of attendance issues at practice, being late, issues at school, he had kind of a troubled background but I can't say that I knew the depths of what he was involved with. I don't think he put the time and the effort into it because he didn't like it (basketball) more than the other things he was involved with." "I didn't go down the traditional route, you could say," Theophil said. "I graduated high school with a 1.8 (GPA), you know? That's hard to do. I just gave up on basketball in high school, even though I still played. Training-wise and all that other stuff, I just gave up ... and that led me to some other stuff, different friends, different crowds and it took me like two years to realize, `What are you doing with your life?' "
In the meantime, Theophil was still smoking pot, still popping pills and still going nowhere. "I didn't know exactly what to believe in at that point," Theophil said. "I tried a bunch of different religions and things, to be honest, to try and get sober and none of them really worked out for me." But after an incident where, when Theophikl was delivering pizza after a day of smoking pot, he nodded off at the wheel and ran into a bunch of large rocks that were in front of a large tree, possibly saving his life. "That was a close call," he said. "If those rocks hadn't been there I would have crashed into that tree." So after a year of ignoring Cesaria's calls, Theophil called him. "I called my buddy and told him I was going to try his God out," Theophil said. "And he said, `OK, dude, just talk to him, it's that simple.' I hung up the phone and I basically started praying. I said, `If you're there, I need you now.' "
"Something in my mind said, `You can't leave you mother, everyone else has left her,' " Theophil said. "So, I stayed. It had to be God." Theophil had also gotten a psychological boost after watching ESPN's 30-for-30 program on Chris Herren, the ex-Boston Celtics guard that overcame serious drug abuse to become a powerful motivational speaker. It was my 21st birthday and I was struggling in my head, thinking, should I drink?" Theophil said. "I was a month away from being sober for a year. I was wrestling with it, so I'm flipping through the channels and the Chris Herren documentary is on. I watch it and after the show ends I said to myself, `I am definitely not doing anything (drinking, drug-wise). I'm going to keep working, keep training and see where this takes me.' "
It took him to the Ludlowe Middle School where Herren was speaking. "I just felt like I had to see him," Theophil said. "My high school coach was there, Brian Silvestro ... now, my high school experience was not like I wanted it to be ... which led me away from basketball. I really didn't like (Silvestro), growing up. But I've reconciled my relationship with him and now, I love him." "He came up to me (at the Herren event) and he'd already started to get his life back together," Silvestro said. "And afterwards, he was beaming, all excited, saying, `This is got me where I want to do more.' And he's put so much time into his game since. He's gotten stronger. He's gotten in shape. He's taking instruction from anyone that will give it to him." At the Herren event, Silvestro told Theophil to speak with UB assistant coach Kranthi Sanadhi, aka, coach Krunch, who mentioned that a lot of kids come to the Harvey Hubble gym in the summer to play pick-up. "I had never gone to that Chris Herren thing," Theophil said. "I probably would have never ended up here." "Here," is at UB, where Theophil quickly drew the eye of Ruane, who honestly, checks up on every college kid when they come to the Hub to play. "Mike would play and whenever the college guys come down I always ask what their situation is and try to advise them," he said. "He had been a player and I thought this (UB) could be a nice fit for him if everything worked out." It worked out but it took time. Because of that 1.8 GPA, Theophil, a non-qualifier, had to sit out a season, not even being allowed to practice. He has played in eight of UB's10 games so far this season, averaging 9.1 minutes in a reserve role. He averages 1.0 point a game, has four assists, two steals and his shooting 40 percent from the floor. , It's awesome. I'm just glad that she gets to see me play again. now, and I'm so happy that she gets to see this side of me. I'm her only kid. "It's awesome," he said. "My mom comes to all the games and I'm so glad that she gets to see me play again. I'm so happy that she gets to see this side of me ... I'm her only kid. "I've never had coaches that believed in me, ever until now, to be honest. It's great to have people like that on my side. I just want to keep doing what I'm doing, keep working hard and get better. I believe that the sky's the limit for me."